SHE may be an atheist but Julia Gillard is receiving divine intervention from religious leaders who support her carbon tax. 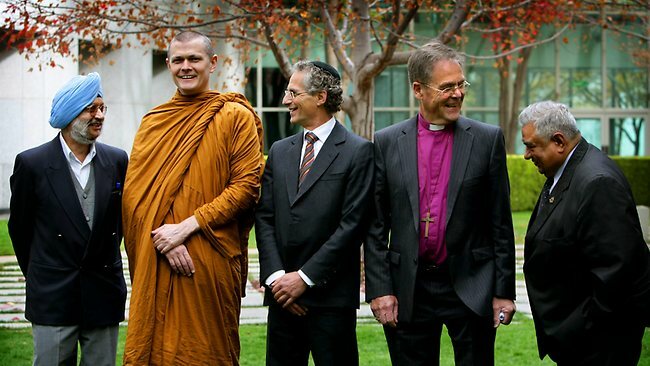 Representatives from all major religions met politicians in Canberra yesterday to discuss climate change action – and they were not praising Catholic Tony Abbott’s plan. The group, known as the Australian Religious Response to Climate Change, wants a price on carbon. A member of Tony Abbott’s front bench said religious representatives were entitled to their views, but they weren’t shared by most Australians. Quoting a phrase used by former prime minister Kevin Rudd, the religious leaders said climate change was a “moral challenge”. Last night Anglican Bishop George Browning said tree planting and recycling could help reduce global warming, but direct action couldn’t do the full job. “We recognise that one policy above all others is required from the political community, namely the pricing of carbon,” Bishop Browning said. “We are aware of the cost this imposes to large sections of Australian society; however, not to act makes no more sense than the protection in the past of outdated technologies, or tariffs to protect industry. “The naysayers are holding Australia back from taking responsible action with their fear-mongering and misinformation. Coalition frontbencher Kevin Andrews said the issue was not as clear-cut as the religious representatives suggested. “In my movement about Australia, that’s not the view that the great majority of Australians have at this stage,” Mr Andrews said. Rabbi Jeffrey Kamins, from the Union for Progressive Judaism, said the push for pricing carbon was not connected to “whether one believes in God”. “This is the moral imperative of our time,” he said. In 2007 Mr Rudd campaigned on tackling climate change and described it as the great moral challenge for this generation. Bishop Browning said it didn’t matter who was in charge, or what their religion, because the issue should be bipartisan. “We urge politicians to provide leadership and not to be swayed by members of society who appear not to hold such views, but wish every choice to be made on the basis of the short-term advantage it gives them”.